Last week, America lost one of its most beloved personalities, comedian Joan Rivers. Her unique tough-talking, satirical style revolutionized comedy in America. Over her 55-year career, she influenced many comics and brought laughter to the entire nation. She will be missed. 1. Laughter is good for the mind and body: Eighty-one years is a pretty good lifespan! What did Joan owe it to? Although there is little scientific evidence to prove any health benefits from laughter, I don’t think anyone is going to argue that it makes for a good time and it can improve your mental state. A big smile and a good laugh can almost instantly improve your mood. Laughter can be a great way to share some quality time with friends, to relieve some stress, and to promote the release of those feel-good hormones that cause relaxation. 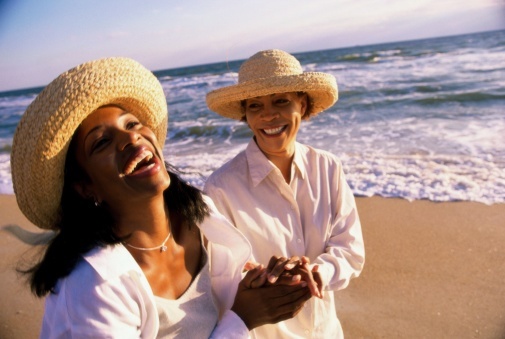 You can even consider taking up laughter yoga to get even more health benefits. Overall, a good laugh can keep you feeling young! 2. Make anti-aging choices carefully: Aging can be a difficult process, especially when you’re in the public eye. Joan Rivers, for example, was in the spotlight for more than 50 years. Because of this, she likely felt increasing pressure to keep herself looking young and glamorous through plastic surgeries. In fact, she became somewhat of a “poster girl” for plastic surgery. And she certainly didn’t hide it. I’m definitely not judging Joan. I just don’t necessarily believe in non-essential cosmetic surgeries most of the time, especially since even minor or routine surgical procedures always carry big risks. While the medical examiner’s office ruled Joan’s autopsy as inconclusive, there’s a possibility that whatever minor procedure she had done could have had lethal consequences. Of course, it’s likely the surgery Joan was having done that day wasn’t cosmetic, but the risk she undertook would have been the same with an eyelift, so the point remains the same. The risk is there, so is cosmetic surgery really worth it? Plus, the older we are, the riskier surgery and anesthesia are. I personally prefer natural anti-aging techniques. Two of the best ways you can stay young and healthy are eating right and getting enough exercise. Foods like blueberries can fight against memory loss and wrinkles, while giving your body high levels of antioxidants that can keep skin tight and even fight diseases, such as cancer. Brown rice, almonds, wheat bran, and other high-magnesium foods can also help keep you feeling young. Magnesium is great for boosting energy levels and libido, and for improving your skin and bowel movements. It’s an essential mineral for longevity and youthfulness. Omega-3 fatty acids, found in fish oil, are also great to prevent the effects of aging. They can prevent and delay cognitive decline, improve memory and mental capacity, and even help lower cholesterol to keep your heart healthy. 3. Don’t take your most essential organ for granted: While the investigation into what happened to Joan Rivers is still underway, it has been reported that she suffered both cardiac and respiratory arrest during a minor elective procedure. This should remind us to make sure we look after our tickers. After all, a healthy heart is one of the most important components to overall health. Although a healthy diet offers countless benefits to your heart, the primary key to keeping it running well is to exercise. Try to get 30 to 60 minutes of exercise every day to keep your heart and body healthy! Griffin, M., “Give Your Body a Boost—With Laughter,” WebMD web site, April 10, 2008; http://www.webmd.com/balance/features/give-your-body-boost-with-laughter, last accessed September 8, 2014. Christensen, J., “Joan Rivers: How a minor elective surgery could end in death,” CNN, September 7, 2014; http://www.cnn.com/2014/09/05/health/joan-rivers-death/index.html. Mann, D., “Aging Gracefully and Naturally,” WebMD web site, August 11, 2003; http://www.webmd.com/healthy-aging/features/aging-gracefully-naturally, last accessed September 8, 2014.